Easily move grand pianos, heavy refrigerators, stoves, furniture and scores of other bulky pieces without effort. Place one of these dollies under each leg. Each of the four weighs only 7.5 pounds and are sturdily built. Total wt. 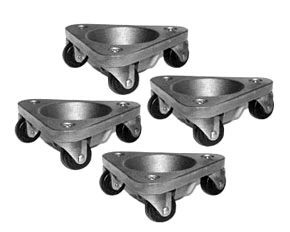 capacity of the set is 1500 pounds or 375 pounds per caster. Do not overload individual casters!!! * Please call us for any questions on our tri wheeled dolly set 4 serving Honolulu, Waikiki and surrounding communities on Oahu.